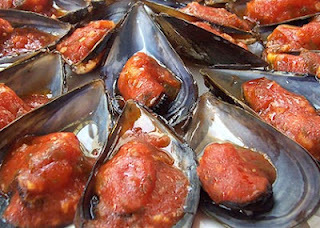 One of our delicious mussel recipes, cooked and served in a superb herb infused onion, garlic and tomato sauce. 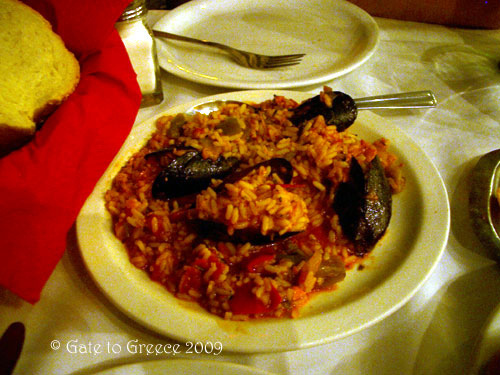 This is a typical recipe in Greece and around the Mediterranean, where mussel dishes are very popular and often seafood is served with an olive oil based sauce. Be very careful to ensure every mussel is cleaned well. If any are open when you buy them before cooking, discard them. Once cooked, if any have not opened, again discard them. These are not fresh and should not be eaten! Clean the mussels by removing any barnacles on the sides and their beards. Put the mussels in a bowl or sink full of water. Swish around for the sand to come out and sink to the bottom. Drain the water and repeat this process a few more times until the water comes clean. In a large saucepan, add 1 chopped onion, olive oil and water. Bring to the boil and cook for about 5 minutes. Add the mussels, cover and cook for 4-5 minutes or until the shells have opened. Remove the mussels using a slotted spoon. Throw away any that have not opened. Strain and reserve the liquid stock. 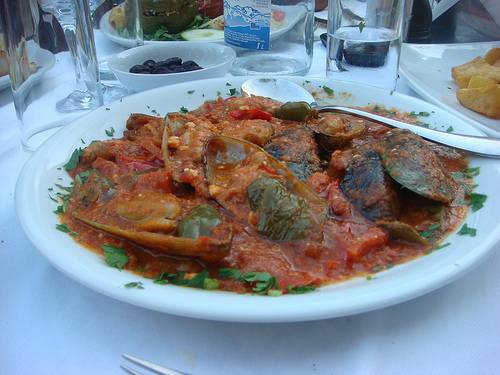 Place the mussel in their shells on a serving plate and keep warm. Saute the chopped onion and garlic in olive oil until golden. Add 1 tablespoon flour and mix in with a wooden spoon. Add 2-3 peeled and chopped tomatoes, and herbs. Simmer for about 5 minutes until the tomatoes have softened to a pulp. Pour the white wine and mussel stock into the pan. Simmer, stirring occasionally for about 8 minutes. Season with freshly ground black pepper and a pinch of saffron. 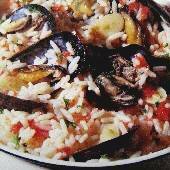 You are not looking for a thick sauce, just enough for the tomatoes to be reduced a little and to add flavour and texture to the mussels. It becomes a delightful orange colored sauce. Pour the sauce over the mussels and garnish with chopped parsley. If you want more sauce or it is too thick, you can add more of the white wine and stock in equal quantities. I highly recommend de-shelling the mussels, adding crumbled feta to the sauce and having it over linguine. It’s amazing!! !